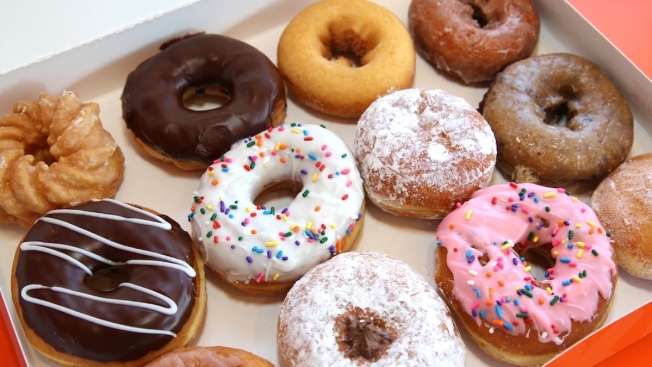 National Doughnut Day is this Friday, June 5. They say there's no such thing as a free lunch. But what about dessert — or, let's be honest, breakfast? The first Friday of June has come to be celebrated as National Doughnut Day, and to commemorate it, fried dough purveyors nationwide will hand out free sugary rings of goodness. Donut varieties are many, from powdered and frosted to embellished and plain, and then there are their extensions — cinnamon twists, crullers, honey buns and cinnamon rolls. But one donut has been crowned America’s favorite, beating out the ever-popular glazed. One recent Ipsos poll, ahead of this year’s holiday, found the cream-filled doughnuts were cream of the crop. To help you prepare for an epic Homer Simpson-esque escapade of “Mmm, doughnuts” this Friday, here's a guide to participating vendors and locations nationwide. Get a free donut with the purchase of a drink at participating stores nationwide. Pick up one free doughnut of your choice, with no purchase necessary, at participating stores in the U.S. and Canada. The freebie is not available in Connecticut or Puerto Rico. Free fried dough classics, along with a complimentary cuppa joe, will be given to the first 40,000 people at New York City’s Madison Square Park starting at 7 a.m. ET. You can get one free Mocha Madness donut with the purchase of any medium drink at participating locations of the New England chain. The midwestern chain is giving away one free doughnut "with a hole." No purchase is necessary. When: All day! You can get one free doughnut with the purchase of a hot or iced coffee or Chill Zone beverage from 5 a.m. to 10 a.m. ET at any newly remodeled store.